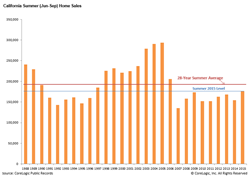 The Federal Savings Bank comments on a recent article regarding seasonal California home sales released by Corelogic.com. The Federal Savings Bank thinks now is a wonderful time for a first-time home buyers to apply and get approved for a 30-year fixed mortgage for a rate just above 4% after points and credit scores are reviewed. Readers should expect even more individuals to enter the market place next year and now is the time to be pre-approved and shop hard for a bargain in the winter months. Whether customer, reality or trusted referral source, The Federal Savings Bank understands how important every purchase or refinance transaction is to help our clients optimize the purchase or refinance of their home.